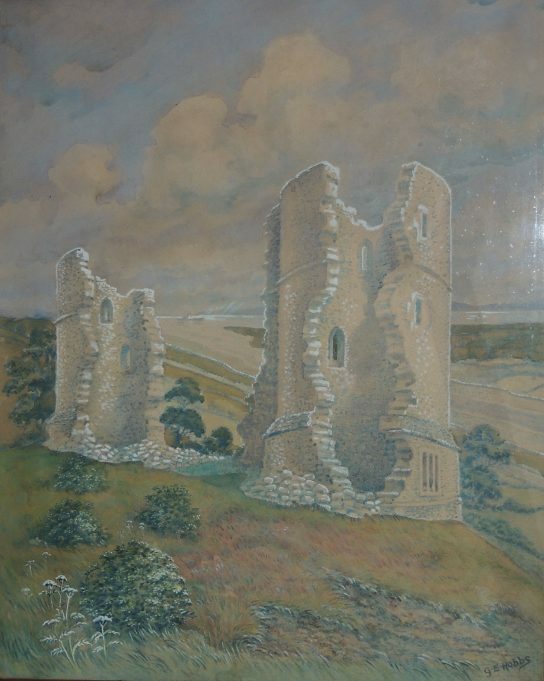 Following our request for information on this artist, we would like to thank Mr Alfred Jiggens for sending in the comment published on this page, together with two images of The Anchor Inn. 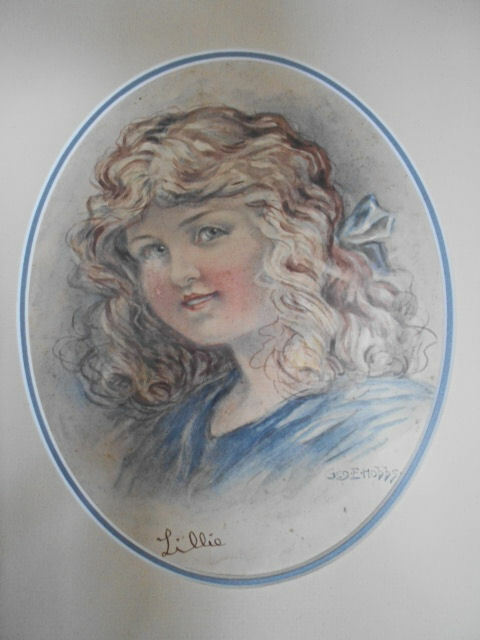 We would also like to thank Eleanor Donaldson (see comment, dated 3rd June 2016, at the bottom of this page) for sending in a photo of a portrait which is signed by Hobbs, showing a young lady by the name of Lillie. Eleanor is interested to learn who Lillie is and wonders whether any of our readers can help. If you have any information, please add a comment at the bottom of this page. 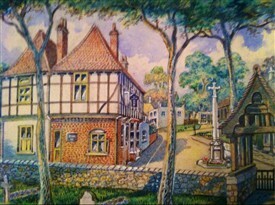 Our thanks also to Geoff Baister for his comment below and the paintings of his Grandparents. 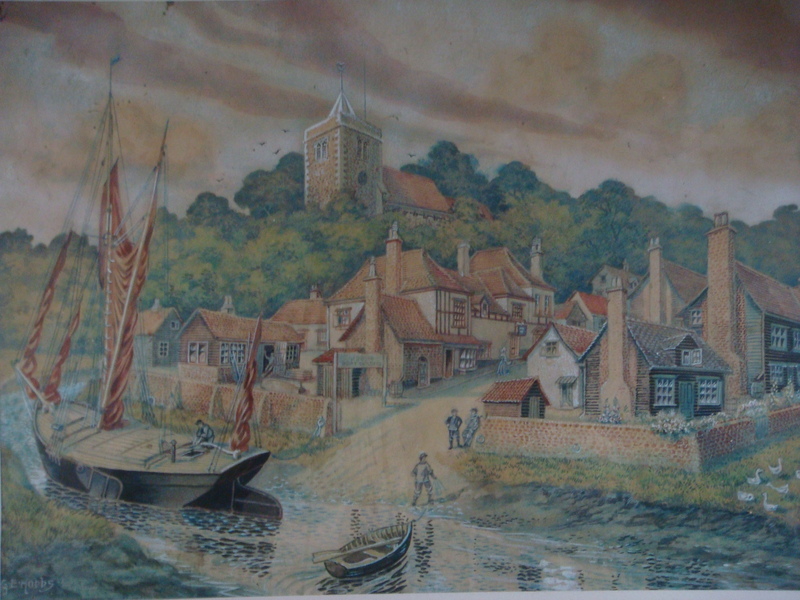 Also thanks to Geoff Peck for his comment and the painting of Benfleet Creek with Ray View in the background. 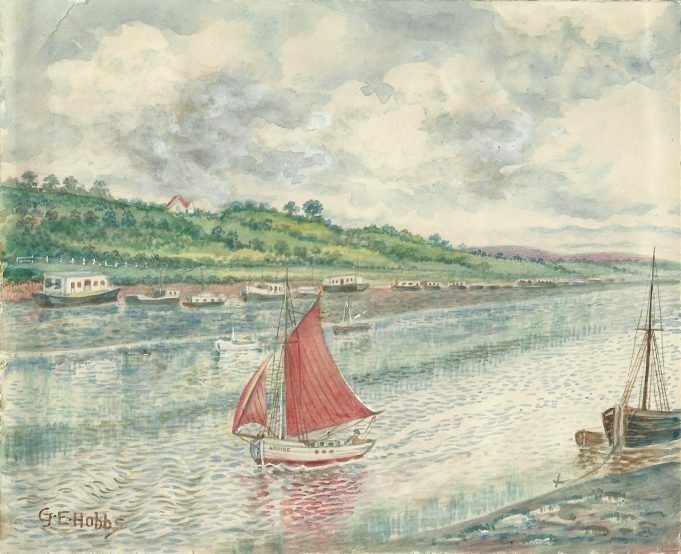 Watercolour of Benfleet Creek with Ray View in the background. 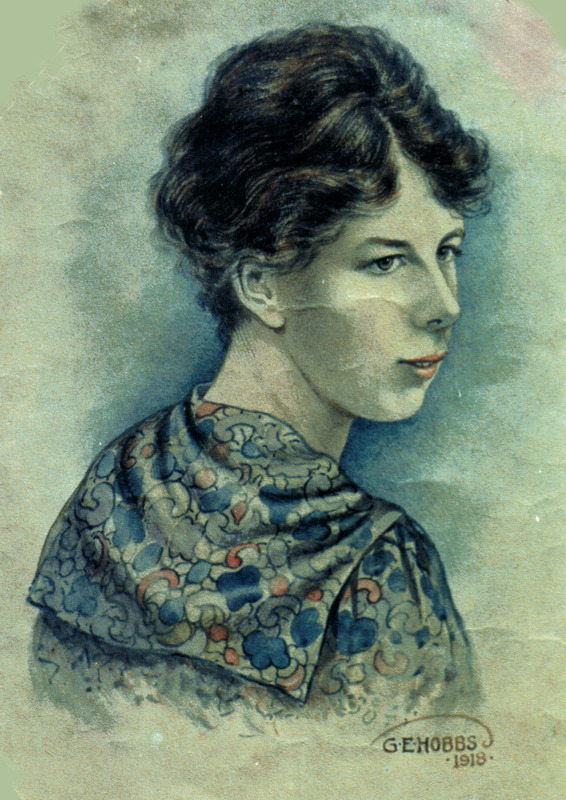 George Edward Hobbs (born Market Harborough, Leicestershire, 1878) came from a family of artists. His family moved to Forest Gate, Essex c.1880 and resided there for many years. The 1911 Census shows the family still at the same address – 35 Bignold Road. George married Mary A. M. Hill in Poplar in 1914. Their two children, George W. Hobbs and Harold Leslie Hobbs, were born in the Rochford district, so it seems likely that George and Mary settled in South Benfleet after their wedding. George was a self-employed artist who worked from home. He wrote and illustrated several children’s books on the theme of brownies (elves) and also stories and illustrations for children’s Annuals. We believe he also illustrated cards for the publisher, Raphael Tuck. We should be very grateful for any further information on George and his family. Perhaps his descendants are still in the local area? I stumbled across this page when researching G.E.Hobbs. 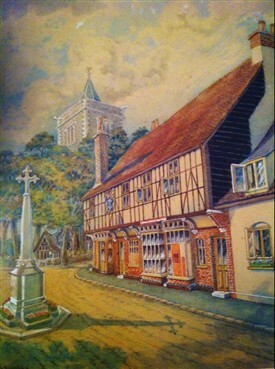 My parents were given a watercolour by G.E. Hobbs as a wedding gift in 1953 and for many years it adorned the hallway in their house and later in mine. It depicts a red-sailed yacht “Louise” in the creek and ‘Rayview’, the house where my mother grew-up, in the background. I can scan and send a copy if you let me know how to send a file. George Hobbs painted my grandparents, probably around the time of their wedding in May 1918. They are just small watercolour / drawings about 5 x 7 inches. 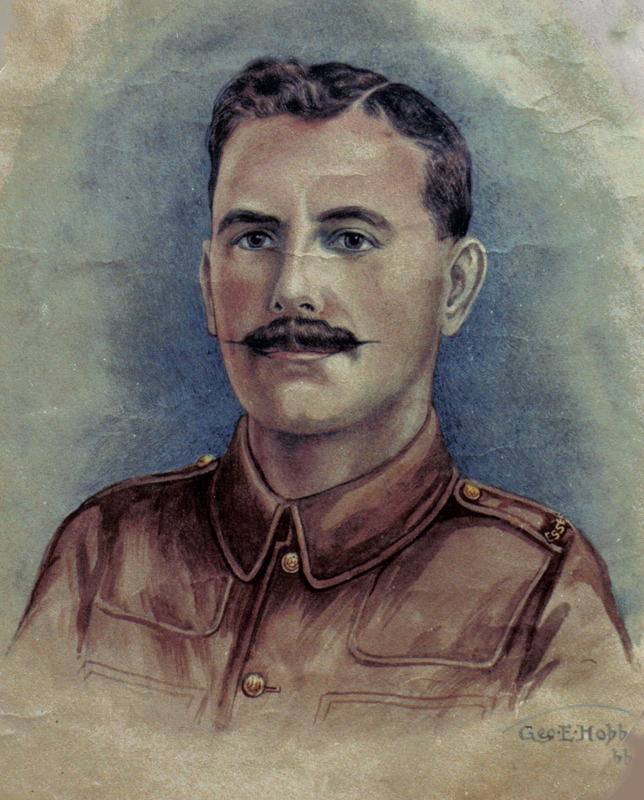 My Grandfather was in the Essex Regiment, and they lived in East Finchley. I have no idea if they knew George or whether it was a commission. I wondered whether he may have served in the Essex himself, but I can’t find any record. If you’d like copies of the paintings, please let me know. Hello from Australia. Friends living near me are related to G.E.Hobbs and are thrilled to see your comments about living near him. I have a photo of a picture they own of someone called Lillie. My friends would like me to send it to you to put on your website.Please let me know how you would like me to send the photo. Fond memories Leslie, and a joy to read. I was brought up at 29 Fleet Road from 1953-65 and George Hobbs was our neighbour at No. 27. He lived with his very deaf wife (you had to shout at her!) in a tiny cottage with a mature back garden having a small stream, high hedges and a far corner tree having a tree house at the top. To climb the wooden staircase circling the trunk gave you views across the railway line to distant Fobbing. In his garden was an Anderson shelter which was used to store fruit and an old railway carriage (minus the wheels) which was his shed and studio – in it were countless drawings, hand made puppets, toys and models all made to the highest standards. He was a very tall, kind man who was well into his eighties and a wearer of big hobnail boots! An extremely polite and well spoken man who must have had a high standard of education in his youth. The cottage and the huge willow tree at our front gates were both removed many years ago. I now live at 23b Fleet Road and purchased the bungalow from the son from Rayleigh. My grandparent’s moved into 23b Fleet Road in the 1960’s, they were Anne and Cyril Harris. Not long after they moved in my grandad found a painting of Hadleigh Castle signed G E Hobbs that had been left in the loft. The painting was on display in their bungalow for over thirty years, and has had pride of place in my living room for twelve years! I would be happy to provide an image to the website. In answer to Miss Parker’s question about 32 Stanley Villas: The Jiggens family lived there from the early 1900’s until 1953. I was born at the house along with my 7 siblings. Previously, my father had lived at the house, and his father lived there before him. When I got married in 1959 I lived across the road at number 25. I lived next door to Mr and Mrs Hobbs who by now were in their 80’s. I can’t be sure whether the Hobbs’ lived at number 23 or 27 because I’m not sure which way the house numbers go. If it helps – from my front door (facing out onto the road) Mr and Mrs Hobbs were living in the house to my left. How fascinating. I can’t believe your family lived there for such a long time. Do you know what year it was built and do you have any photographs of it? I moved in to no. 32 in 1999 – 2005 and believe you and me – loved it to bits. There was still the outside loo up until we sold it in 2005 and a little fish pond towards the bottom of the garden. When we decorated the lounge – underneath the floorboards we planted an Evening Echo with my name scribbled on it for someone in the future to find. Also there was a brick fireplace in the lounge which we loved and wondered how old it was. I have so many good memories of the house and was sad to leave it. My late cat Oscar used to climb all the way up on top of the roof and I reckon he had the best view in Benfleet. A very special house. Before I lived there a Mrs Hopkins lived there and before her a dutch lady, I believe. I wonder who purchased it from yourself. As for the numbers on the other side – you’ve got me there. Thank you for your response – fascinating. I also lived in Fleet Road in one of the old Stanley Villas. Does anyone know which number Mr G E Hobbs lived at? Also does anyone have any information on Stanley Villas? I lived at no 32 about 10 years ago and have always wondered who lived there before. Mr Hobbs lived in Fleet Road, Benfleet. I lived opposite him for 20 years and also lived next door to him for some time after I got married. I have images of 2 more pieces of his artwork which I would be happy to provide to this site. (See the two images above).